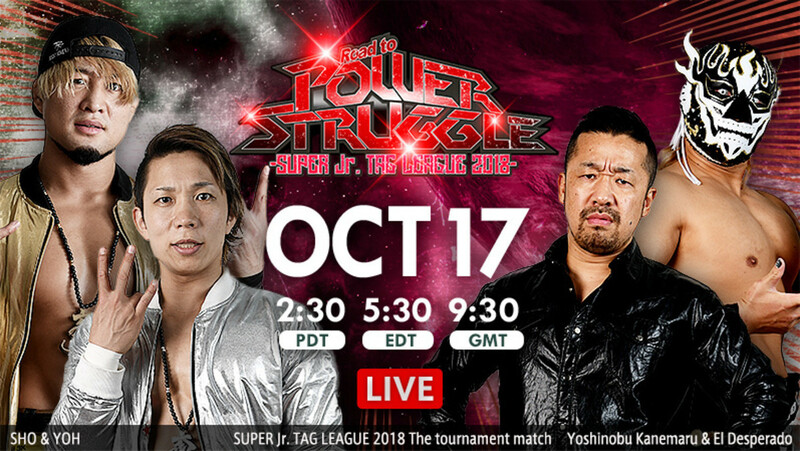 The second day of Super Junior Tag League action continues this morning with more matches taking place inside Korakuen Hall. Tonight’s matches include Tiger Mask & Jushin Liger vs. Soberano Jr. and Volador Jr., ACH and Ryusuke Taguchi vs. Robbie Eagles & Taiji Ishimori, Chris Sabin and KUSHIDA taking on Shingo Takagi & BUSHI and Roppongi 3K vs. El Desperado & Yoshinobu Kanemaru in the main event. The tournament will run through November 1 when the top two teams will face off against one another at Power Struggle. It’s still early into the tournament, so no one’s leading the pack thus far. The undercard has a number of multi-person tag matches, with the most high profile bout pitting Kazuchika Okada, Toru Yano and Best Friends against Jay White, Bad Luck Fale and the Guerillas of Destiny. Join us for live coverage this morning at 5:30 a.m. EDT. There will be English commentary. Yoshida and Honma went at it. Yoshida connected with a penalty kick, but Homna took him down and landed the kokeshi. Yoshida worked with Narita, who also took a nasty penalty kick to the back as well. Tsuji came in and looked great. He managed to battle out of a Boston crab attempt by Umino, but managed to escape. Umino quickly got it back in and this time Tsuji tapped. A good opener. Yoshida and Umino got into each other’s faces after the match, as well as Uemura and Narita. Story of the match had Henare being worked over constantly as Ibushi and the Bullet Club worked him over well. Even when Henare found an opening to tag, he couldn’t as his partners were taken out. Henare instead had to handle Ibushi and his kicks. Henare finally tags out to Tanahashi, who went after Ibushi, who seems to be serving as a surrogate to Kenny Omega for this tour. They had a great exchange, including Ibushi busting out a jumping hurricanrana. Henare and Owens are tagged in and after a good exchange Henare walks right into the package piledriver for the win. Yano tried to use his tricks early but the OGz beat him down and worked him over as others on the outside beat up the rest of CHAOS. Beretta and Tama Tonga had some nice back and forth here as well. Okada is tagged in, but the OGz quickly work him over, capitalizing after Fale landed a big splash. After everyone came in for a bit, Okada came back and started to get his head back, including landing a bodyslam on Fale. He went for the rainmaker on Loa but Gedo walks in and blasts him with brass knuckles for the DQ. I really liked when these used to be rare. White went for the Switchblade after the match but Tanahashi ran to make the save. Tanahashi stood in the ring waiting for Okada to get up, but Okada bailed out of the ring instead. Super Jr. Tag League: Jushin Thunder Liger & Tiger Mask defeated Volador Jr. and Soberano Jr.
Tiger Mask and Soberano did some good mat wrestling for a bit. Volador got the heat on Liger, with both he and Soberano working over the leg that cost he and Tiger Mask their match from last night. Liger finds his opening after Volador accidently kicks Soberano on the apron. Everyone comes in. Soberano laid out Tiger Mask with his tornillo. He doesn’t seem used to these ropes as some of his stuff looked a bit off. Tiger Mask catches him with a crucifix, but he kicks out. Tiger Mask lands the tombstone on Soberano and Liger comes in with a shotei. Liger hit the Liger Bomb and Tiger Mask hit the Tiger Bomb, but Volador broke up the pin. Liger dispatched him out of the ring as Tiger Mask hit the Tiger Suplex for the win. Good match, not great but was a very good, basic match. They brawled outside of the ring early. Ishimori took care of ACH insider the crowd and brought him back in. ACH was worked over as the announcers sold the idea that he may have suffered rib injuries like Will Ospreay did the other day. It ended up looking like he might have injured his leg in a dive early on in the match. Taguchi tags in and runs wild. ACH does manage to come back in and works with Ishimori, who ended up getting the heat on ACH once again. The two reversed one another in tombstone positions until Ishimori connected with the double knees. Eagles took out Taguchi from the outside as Ishimori connected with the Bloody Cross for the win. This was alright, though I think both teams had better matches last night. Some good back and forth early, with Takagi and KUSHIDA working together while BUSHI and Sabin battled each other. They end up getting the heat on Sabin. Shingo took him out of the ring and brawled with him as BUSHI kept the heat on him in the ring. Sabin rolled up Takagi then tagged in KUSHIDA, who made the hot tag. KUSHIDA hit a giant tope con hilo from the middle rope to the floor on Takagi. He came back to the ring and worked over BUSHI’s arm with an armlock. Sabin takes control of things, taking out BUSHI on the apron and connecting with a tornado DDT on Takagi for a nearfall. Takagi caught him with a pop up death valley driver. Takagi laid out Sabin with a inverted facebuster then hit the pumping bomber for a nearfall, then got the pin with the Last of the Dragon. Another good match, great heat towards the end.Takagi is clearly a standout in this junior heavyweight roster. Kanemaru and Desperado jumped Roppongi 3K as they entered the ring and started a brawl outside of the ring.Desperado rammed SHO back first into a row of chairs and smashed one of his knees with a chair. Meanwhile, Kanemaru bodyslammed YOH on the exposed floor. YOH was worked over for a bit until SHO made the hot tag. From here, it’s a big back and forth battle. Roppongi 3K hit stereo knees to Kanemaru, but he hit the whiskey mist on them both. YOH kicked out of the moonsault but Kanemaru went for the Deep Impact. He connected from the middle rope, but YOH kicked out. SHO blocked another Deep Impact attempt but Desperado came him and took care of things. Kanemaru went for a brainbuster on YOH but YOH blocked it and pushed him into Desperado. SHO took care of Desperado as YOH rolled him up with a bridge. It didn’t look pretty, but it got him the win. A good main event that also had good heat. Desperado and Kanemaru jumped RPG3K after the match, but left as Rocky stared them down. SHO and YOH cut a promo promising to win the league and the titles. Rocky Romero promised revenge against Takagi and BUSHI to close out the show.